Pros and Cons of Facebook's "Non-Mail"
Mark Zuckerberg insists that Facebook's new Messages service is not e-mail, because it combines e-mail, SMS, IM, and Facebook messaging into a single thread. But as Facebook rolls out its non-mail service over the next few months, users will be able to get facebook.com e-mail addresses, and use Facebook's Website or iPhone app as a hub for all written communications (Facebook hopes). The intention is obvious: though Zuckerberg says he doesn't expect people to drop Gmail and Yahoo Mail immediately, he says that, over time, people might prefer Facebook's simpler system. Facebook's big pitch is that you no longer have to remember the contact method of choice for friends and family. Currently, you might have a relative that only checks e-mail or a friend who is best reached by text message. If these people use the new Facebook Messages service, the delivery method would be a non-issue. Just send the message, and the recipient will get it as a chat window, an e-mail, or, optionally, a push notification on their iPhone--whichever they see first. As it stands, the separation of e-mail, SMS, and IM isn't necessarily a bad thing. Maybe you don't want messages from Facebook friends showing up in your inbox. Or perhaps you have contacts from outside Facebook that you don't want to hear from in text messages or chat windows. There's great potential here for information overload. 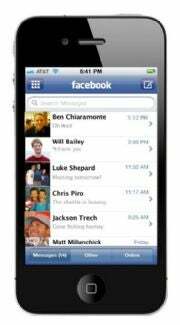 A big problem with e-mail, Zuckerberg said, is that it's slow. To send a message, you have to enter an address, think of a subject line, and type things such as "Hi Mark" and "Sincerely, Jared." Those formalities seem superfluous when an entire history of communications with a contact are shown in a single thread, so you can happily trim the fat and just talk. The flip side of unified communication is that formalities sometimes exist for a reason. If I'm e-mailing an editor about multiple topics, the subject line gives context. If my parents send flight information before they come to visit, it's nice to look that up at the subject level instead of searching through a massive conversation thread. Sometimes, blind carbon copy is really useful. Ditching the subject isn't always ideal. Gmail's priority inbox was a neat idea, but the algorithm apparently wasn't smart enough for the way I communicate, and nearly every new message was flagged as urgent. Facebook has a better system: By default, your friends and their friends appear in one category. Other e-mails get a second category, and spam is relegated to a junk folder. Then, you get the power to demote overly chatty acquaintances or promote important contacts that aren't on Facebook. You can also change your priority inbox to include only friends, or everyone. If you work at a company that blocks Facebook, you're out of luck for checking personal e-mail. Facebook is working on IMAP support, so you may be able to set something up, but it won't be as convenient as visiting the websites of Hotmail or Yahoo Mail. Still curious? You can request an invite here, or find out more at Facebook's help page.